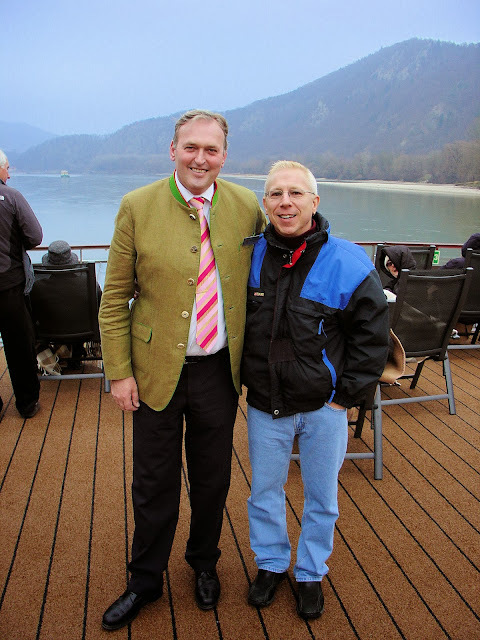 Making friends onboard Viking River Cruises. 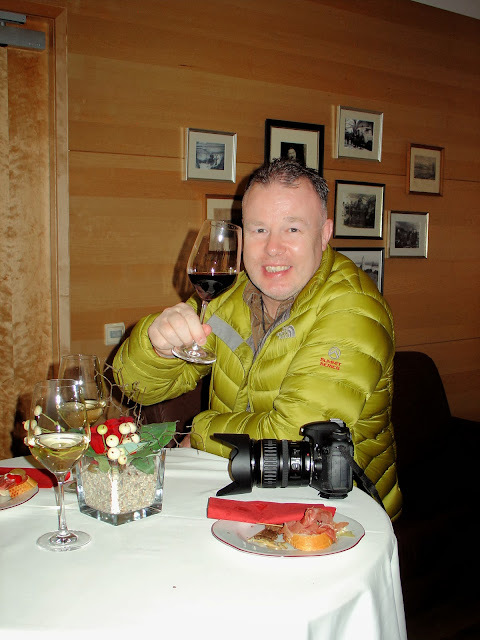 All photography is the property of EuroTravelogue™ unless specifically attributed. Unauthorized use is prohibited. If you know me, then you know how I love to savor the journey as well as the destination, and my last voyage, my "Danube Waltz" with Viking River Cruises was no exception! Soon after our cruise began, I realized that I was having the greatest time of my life, not only because my dream of a Christmas market cruise through Europe was coming true but because of something even more special—paramount to any journey as far as I am concerned—the friends I've met along the way; those special people who touch our hearts and enrich our lives immensely. 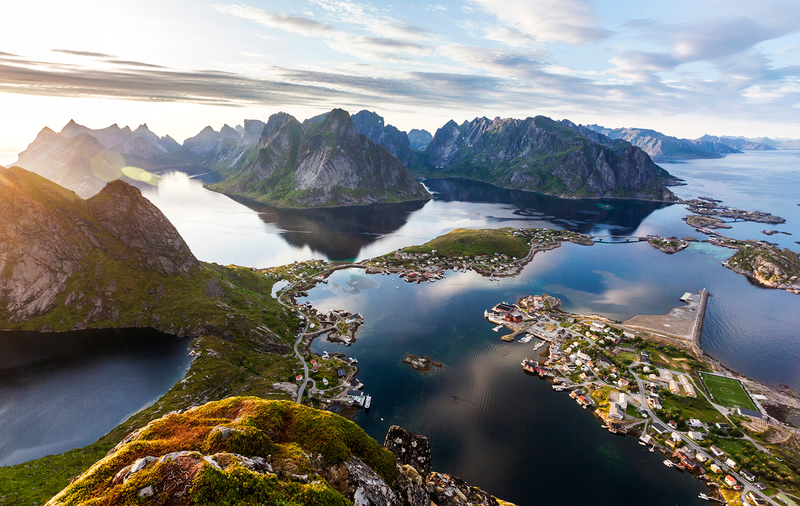 Actually, it comes as no surprise really because the intimate gathering places onboard the Viking longships create the perfect settings to cultivate and nurture those new found friends from afar. From the Viking crew to the traveling guests, chances are you're going to bump into each other quite often—an exchange that I welcomed and embraced at every chance encounter. Here's my story of some pretty special people I've met during my voyage. Sharing a potato pancake with our concierge Verona. Beginning with the crew, I have fallen in love with many of them not only because of the exceptional service they provided but because they became dear friends while onboard the ship. Chief among them is our concierge Verona. From the moment you arrive to the moment you disembark, her mission is clear—to pamper and see to everyone's needs onboard. Not only was she there to accommodate every request and grant every wish, but no matter the occasion, she rose above and beyond the call of duty in all she did. She was never too busy to help, even with the smallest request such as posing for a picture or sharing a potato pancake with me in Bratislava—a memory to last a lifetime. Then there was our cruise director Jochgum or Joey as he preferred since he believed most of us could never pronounce his real Dutch name. Not only did Joey see to entertaining us onboard with special presentations and our daily briefings, he was out and about on all of our excursions making sure we were armed with the knowledge and ready for the day. He was our lifeline to the ship ensuring we knew where to go and where to return, and just being there to offer his assistance if we needed it. Always there to give us "insider" tips about the destinations too, he is an absolute invaluable member of the Viking crew! One of my unforgettable magical moments was when we were sailing into Budapest, the city of gold, with Joey's narrative echoing on the top deck and throughout the ship explaining in full detail the history of the city and its iconic landmarks. Me and Wilhelm, our hotel manager onboard the Viking Skadi. Lastly, Wilhelm our hotel manager was a giant lovable teddy bear with the disposition of a puppy. As with Verona and Joey, Wilhelm saw to our every comfort as well. Always appearing with a smile on his face and ready to give you his undivided attention, he had the ability to make you feel special and was a true delight on our voyage. 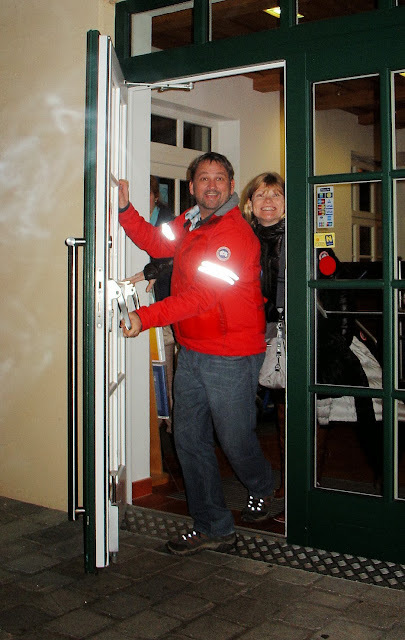 Some of my favorite moments were during our Austrian lunch onboard where he greeted all of the guests with his tantalizing and scrumptious introduction to Austrian cuisine. He was our first stop along the buffet line and served up the best bratwursts yet! Another unforgettable moment was during our sailing into Budapest when Wilhelm was on top deck handing out blankets and cups of glühwein to keep us warm. He has a heart of gold! One of my favorite times of the day was after dinner when I would retreat to my little corner of the Viking lounge to catch up on writing and sharing reports of our adventures for the day. As I worked, I loved listening to the melodious sounds of Sylvia at the piano whose voice resonated above the din of the room. She serenaded the guests with the sounds of Christmas as well as the classics and socialized with all of us while on break—a lovely creature! Each night was bliss! A chance encounter as we sailed through the Wachau Valley in Austria. Suddenly, the "Viking Social" club emerged from our cabins at the same time to snap some photos of each other. I don't think we could have planned this any more perfectly. Pictured here are Brittany, JohnnyJet and Natalie. 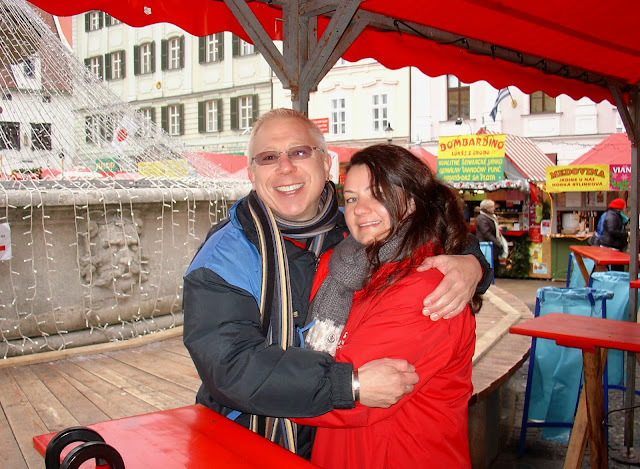 Two incredibly special friends, Chris and Lisa Owen of Chris Cruises.com. I was excited to take part in the first-ever "Viking Social" whose mission was to report on our enchanting Christmas market cruise throughout the week. Viking even gave us a special introduction in the "Welcome Aboard" letters. Not only was I going to see my friends from Viking again but finally came the chance to meet fellow journalists and social media extraordinaires whom I've known virtually for a few years but never had the pleasure to meet face to face. As we worked and played, we spent a lot of time getting to know each other and by the end of the cruise, I can honestly say that each is even nicer and kinder in person than I could have imagined. As I mentioned above, our fortuitous encounter with the "Viking Social Club" as we sailed through the Wachau Valley in Austria. 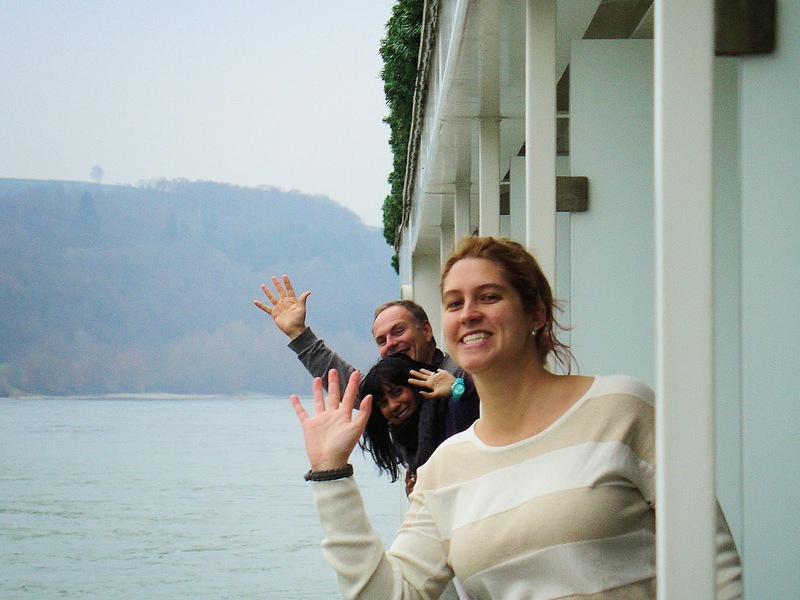 Pictured here are Carrie, Jessica and Deb of The Planet D.
Dave and Deb of the PlanetD emerging from the Winzer Krems Winery in Dürnstein, Austria. Iain of Mallory on Travel enjoying a glass of wine at the Winzer Krems Winery in Dürnstein, Austria. Finally many of the guests onboard quickly became my friends, friends I never knew I had. 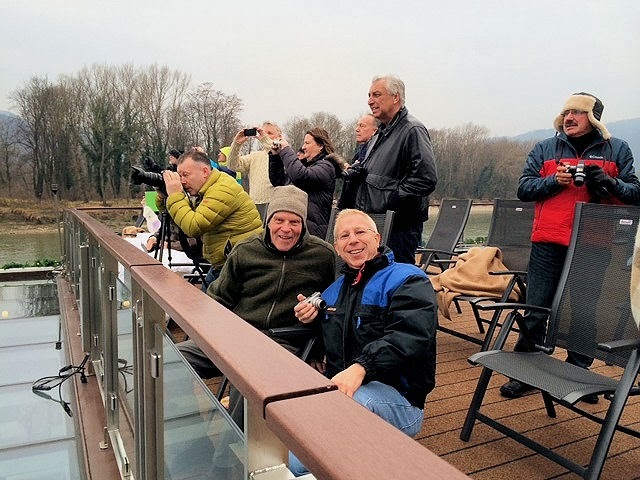 Among these is one very special couple from Vermont, Kathy and Fred who I shared many an afternoon with in the Viking Lounge and on the Sun Deck as we sailed through the Wachau Valley in Austria. And, I met another special lady who just happened to be a fan of EuroTravelogue. I knew she was going to be onboard this sailing and couldn't wait to meet her face to face. What a pleasure it was after corresponding electronically in the weeks leading up to the cruise. I only wish I could have spent more time with her. Here I am with Fred, one half of perhaps the sweetest couple I had met onboard. 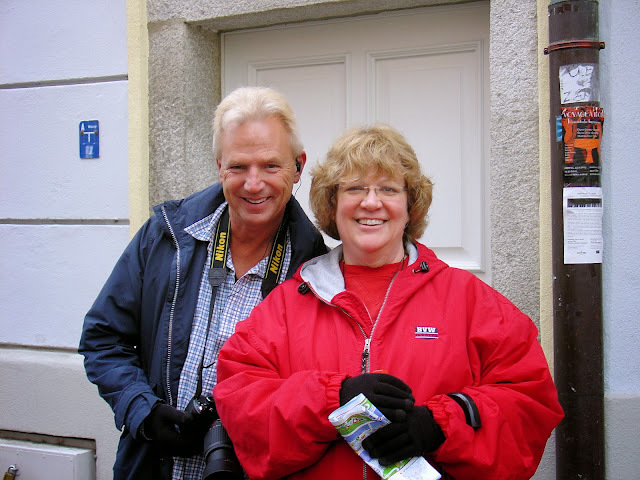 Fred and I are enjoying the views of the Wachau Valley in Austria while his wife Kathy snaps this photo of us. Photo: Kathy Hall. We also met a wonderful group of folks from New Orleans and Connecticut who collectively comprised "our gang." Each day, we gathered in the lounge to regale the group with stories of the day, play games, enjoy the evening entertainment and so much more. These very special people are now friends for life! A real surprise and delight that I discovered onboard was the number of guests I had met throughout the cruise who shared their love for the Viking product in many a conversation. 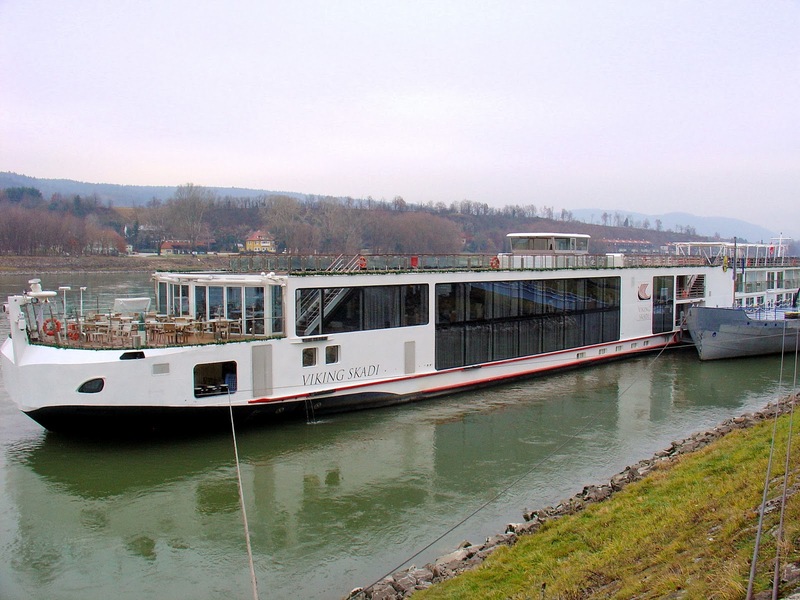 I was astonished to find out how many were repeat guests—a dream come true for any product supplier in the industry—who have sailed up to five times in the past and had up to three more river cruises booked for next couple of years. 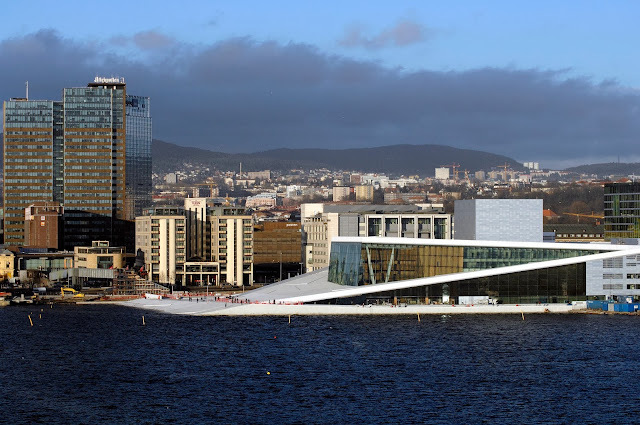 Two couples I met even had their Viking Oceans reservations made for the inaugural sailing of the "Viking Star" in 2015. As you can see, the journey and friends you meet along the way are just as enriching as the destinations themselves—a winning combination for the perfect holiday and an integral component of the Viking river cruise experience. I urge you to seek out such experiences, reach out to guests and crew, spark up a conversation, share a piece of yourself and invite them to do the same. It was wonderful sailing with you Jeff! What wonderful memories we have of that trip! The feeling is more than mutual my friend! I have a lot of wonderful memories too and so happy that we had the time together and to get to know Lisa too!! Thank you for stopping by and sharing your thoughts! Viking seems to make their cruises very special so I'm not surprised they have repeat cruisers. I love the stories of the people you've met - from other passengers, crew and travel professionals. In addition to the destination, it's the people we meet during our travels that make each place memorable. Over the years, I've kept in touch, sporadically, with many people - from locals to travel people. But I was very surprised on Christmas Day when we got a call from our Cape Town guide. It just made our day. Truly all of these folks contributed immensely to my experience onboard the ship!! How wonderful that you've kept in touch with some folks and that you received a call on Christmas day from one of them!! That must have sent you over the moon! Thanks so much for stopping by and sharing your stories!! The people you travel with (especially if you'll be travelling together for more than 3 days) must be an enjoyable lot and it seems so in this cruise of yours. Happy for you! Hi there Marlys. I couldn't agree with you more and to add to you sentiment, I loved bumping into all them over and over again. Actually, the bonds you build when familiarity sets in are immeasurable and strengthen with each encounter! Thank you so much for stopping by and sharing your thoughts! Hi there Paula and thanks so much for stopping by. I truly had one of the best experiences of any of my trips!! It was a fabulous journey! Looks like a great cruise. We traveled on the Freya a few weeks before you and loved the experience. You are so right about how special people can make a special journey~! Hi there Irene!! You know, the people onboard our cruise inspired me to write this ... I just had to share with the world how special all of them were!! So happy you sailed the Freya weeks before...I bet you had a wonderful time too!! Thank you so much for stopping by and sharing your experiences. I love to read comments just like this! 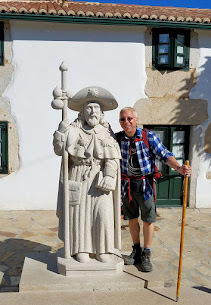 Excellent post, Jeff - it made me pause and think of many of the lovely people that we have met over the years on our travels. 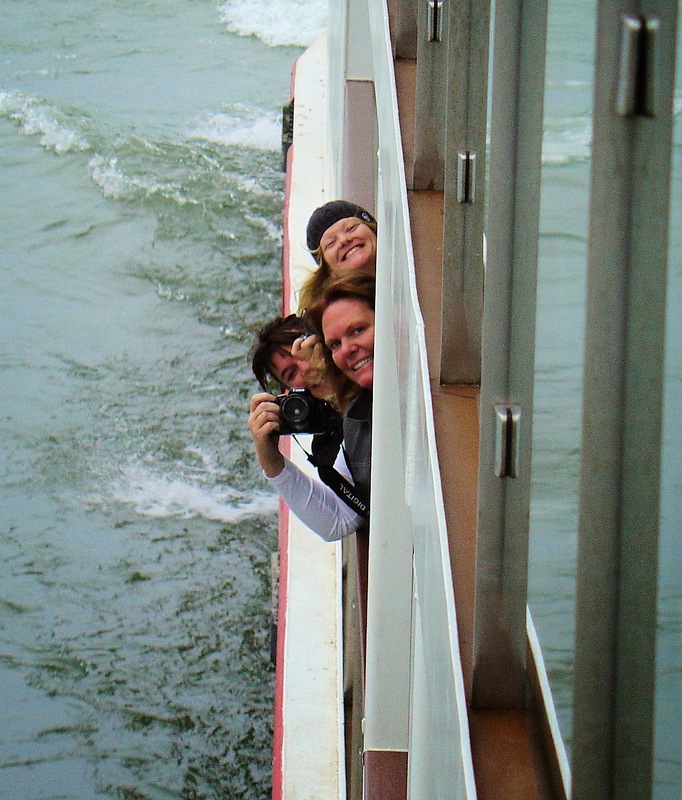 Many of my best travel memories are the people that we have met along the way! Hi there Lisa! It was these very same people who inspired me to write this post while onboard! One afternoon I just had a revelation when I realized how these kind folks have really added to the overall experience, making truly an unforgettable time for me! I am eternally grateful for having met each one of them! Hi Lisa and thank you for your kind compliments! What ship were you sailing on? The Embla? Thank you for stopping by and sharing your thoughts!! Excellent article Jeff! I was also amazed by the people I met - staff, crew, fellow travelers and bloggers/photographers/videographers I met. The cruise itself was fabulous but the people and the friendships can last a lifetime. Much better than when they make you unfairly leave the boat after the cruise ends! Ha Kay! I couldn't agree with you more about being made to leave the ship on the last day! :) All too often we're so excited about the places we're setting out to explore, but we can't ignore the endless encounters and friendships we'll make along the way for sure! Thanks so much for stopping by and sharing your thoughts!